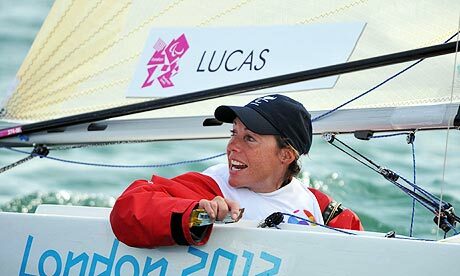 Helena Lucas holds the impressive distinction of being the first Brit ever to take a gold in the sailing events at the Paralympics. Helena suffers from a condition that affects both her hands. Despite this, she initially focused on competing in the 470 class in non-disabled competition, attempting to qualify to compete for Great Britain at both the 2000 Sydney Olympics and the 2004 Athens Games. After 2004 she switched to sailing in the 2.4mR class, a Paralympic event contested in a single-person keelboat. In 2006 she stood in for Shirley Robertson as a member of the British crew in the Yngling event at a test event for the 2008 Summer Olympics in Beijing, China; competing alongside Annie Lush and Lucy MacGregor, she won a silver medal. It was a slightly strange way that Helena ended up winning her gold. It was not quite the way the British sailing team had imagined winning its first ever Paralympic medals. A dearth of wind on the Dorset coast meant the team spent the final hours of the six-day regatta holed up in the GB rather than charging for the finishing line in Portland Harbour. Not that Helena was too worried. She was leading the standings and so took gold in the single-person 2.4mR, a huge achievement in the trickiest boat and probably the most competitive of the three Paralympic classes. Helena, the only woman in the 2.4 fleet, went into the final day with a nine-point cushion after a brilliant regatta. Helena was one of the last sailors to be picked for London 2012 and said there was a “huge sense of relief” that the years of hard work had paid off. The medals are a vindication of the British sailing team’s all-encompassing approach. There was soul-searching after the Paralympic sailors returned from Beijing empty-handed. Since then the Paralympic sailors have lived and trained cheek by jowl with the Olympic squad. Working alongside competitors such as the four-times gold medallist Ben Ainslie has inspired the six Paralympic sailors – the same group that failed in Beijing – on to greater heights. 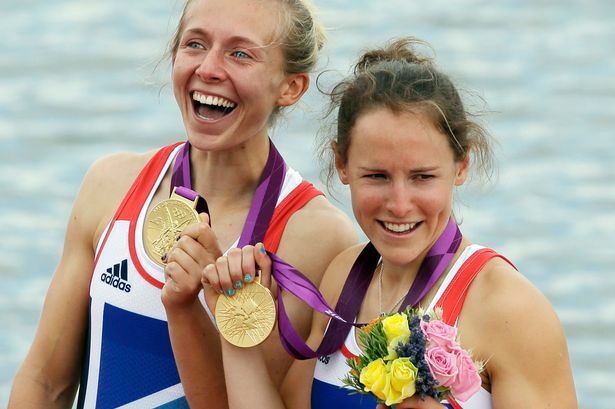 Of all the four gold medals won at Dorney Lake, that of Katherine Copeland and Sophie Hosking was by far the most joyously unexpected. They had only joined forces in a boat three months earlier, boasting a solitary World Cup silver medal to reflect their partnership, and yet they cut through this Olympic final with a wonderfully controlled exhibition of sculling. Feeding off the roar of a tumultuous 30,000-strong crowd, they delivered an improbable final flourish to seal Britain’s most successful regatta in Olympic history. Sophie could not have avoided rowing if she tried, with a Father who won gold at the World Championships, and a rowing scholarship at school. She tried to buck destiny and play football, at county level and then for Wimbledon Ladies, but missed rowing. She was a stellar talent at DurhamUniversity, and from there made it into the national under-23 team, then the seniors. She had been partnered with Hester Goodsell for the past three years, and the two won medals at World Cups, and bronze at two World Championships. But waiting in the wings was Katherine, rapidly becoming the brightest new star in the under-23 team, and ready to do more. Like Sophie, Katherine is a product of Britain’s strong school rowing system, this time at YarmSchool in Teeside, from where she reached the Coupe team, an under-18 group which acts as a development squad for the international juniors. Sophie was pulled into the under-23 team last year at the age of 20 to make the most of her lightweight physique, and promptly matched Peter Chambers’ achievement by winning the under-23 lightweight single World Championship. She was then taken to the senior World Championships to be blooded in top-level competition, as the coaches had already realised she would be a strong contender for the Olympic team. In March of this year Sophie fulfilled her potential by beating Katherine in the national team trials. This and other results in testing suggested that the two should form a new partnership. Their new boat had promise but in the World Cup regattas they kept being caught out, unable to produce a sprint finish. That was until they took their gold. Today I’m publishing my e-book of British female Olympians and Paralympians, past and present. It charts their hard work and dedication for their past achievements or in the build up to London 2012 this summer. This is going to be a great summer for London, our Olympians and Paralympians and I’m sure you join me in wishing them all huge luck. 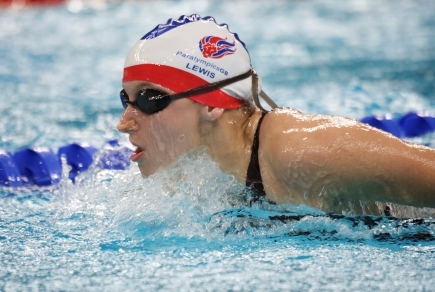 Nyree Kindred, nee Lewis, is one of Britain’s most successful paralympians and will be competing again at this summer’s games as a swimmer. Nyree took up swimming at the age of 5, after she was taken to a swimming pool by her aunt and encouraged her to give the sport a go. Nyree quickly developed a taste for the fast-pace competition and was soon taking part in elite level races. She was selected for the national team in 1999. Nyree has a form of cerebral palsy and therefore competes in the S6 (butterfly, backstroke, freestyle), SM6 (medley) and SB5 (breaststroke) classifications. Nyree began her fantastic Paralympic career at the 2000 Games in Sydney, where she amazingly won three medals; two silver and a bronze. She enjoyed further success at the 2004 Summer Paralympics, where she won the gold medal in the S6 100 metres backstroke event, in a new Paralympic record time of 1:32.03. She followed this up with another gold in the 4×50 m medley 20 pts relay, silver medals in both the 100 m breaststroke SB5 and 200 m SM6 individual medley, and a bronze in the 400 m freestyle S6. Nyree didn’t enjoy the same level of success at the Beijing Paralympic games. In the 100 metres S6 backstroke she was, surprisingly, beaten into second place by Dutch swimmer Mirjam de Koning-Peper. She later explained her defeat by saying : “My legs were spasming, but to be honest, there are no excuses for that, … I should have gone quicker but it just wasn’t there tonight”. In addition to this medal winning performance Kindred also reached the finals of the 100 m breaststroke SB5 (finishing 4th), 200 m SM6 individual medley (finishing 6th) and 400 m freestyle S6 (finishing 6th). Nyree’s husband is fellow British Paralympic- the gold medal winning swimmer Sascha Kindred. Together the pair are known as the ‘golden couple’ of British disability swimming. They will both be swimming for Britain this summer and I’m sure both will be working hard to bring home the gold for Britain. This week’s post in the series on women Olympians features Rachel Morris. Rachel entered the history books at the Beijing Paralympics when she became Britain’s first ever handcyclist to enter the competition. Not only did she take home the gold, but she then went on to become the only British handcyclist to be crowned double World Champion. Rachel was born in Guildford, Surrey, and grew up in Farnham where she attended St. Peters School. She demonstrated a keen interest in sport and also helped disabled members of the local community as a Girl Guide. She completed a Duke of Edinburgh programme with the Royal Yachting Association at Frensham Ponds Sailing Club, which introduced her to sailing, a sport in which she reached international level. On Rachel’s 17th birthday in April 1996 she suffered an ankle injury that triggered the onset of an extremely rare and painful illness, Complex Regional Pain Syndrome or CRPS. This led to her left leg being amputated above the knee in January 2003 and a few years later, the disease had spread to her right leg, forcing a second amputation. But Rachel’s interest in sport continued when she bought a handcycle attachment for her wheelchair. She quickly reached a level that where she was competing in 2007 in Barcelona and became the double World Champion, winning both the Time Trial and Road Race competition. It was this that led to her receiving formal Olympic funding, and she went on to win gold in Beijing 2008. Rachel is looking to defend her title this summer in London and all her supporters on her home turf will be hoping the same. 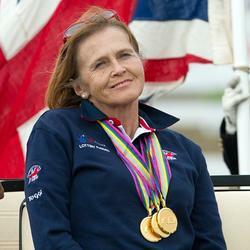 Anne Dunham is one of the most successful British equestrian to have competed at the Paralympics. Anne’s love of horses began when she was very young and worked at a local stable in her spare time and, by the age of 16, she was running a yard of 80 horses at weekends. She had “always wanted to compete” but while she was able to ride the horses in the stables it was their owners who competed with them. At the age of 27 Anne was diagnosed with multiple sclerosis and has used a wheelchair since the age of 30. It was not until she turned 40, when her husband sold his business, that she was able to buy a horse and begin to compete. Anne first competed at the Paralympics competing on her horse Doodlebug in dressage events at the 1996 Atlanta Games. She won a bronze medal in the individual mixed Kur trot grade II, and gold in the open team event. In the individual mixed dressage grade II she finished just outside of the medals in fourth position. Anne’s success continued at the 2000 Summer Paralympics, in Sydney, Dunham was part of the team that successfully defended their title in the open team dressage event. In the individual events at the games she finished fifth. 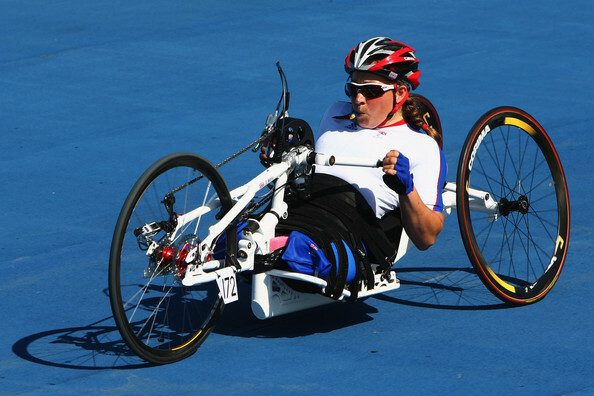 The 2004 Athens Games were Anne’s third Paralympic appearance. As part of a team with Lee Pearson, Debbie Criddle and Nicola Tustain she won her third consecutive gold medal in the team dressage. But in her fourth Paralympics in 2008 Anne, then aged 59, won her first individual gold, competing on her horse Teddy Edwards. She also won silver in freestyle. In recognition of her achievements Anne was appointed Member of the Order of the British Empire (MBE) in the 2009 New Year Honours. This week’s post in the series on women Olympians features Shelly Woods. Shelley is one of Britain’s best athletes in the long distance wheelchair category and will be competing this summer in the London 2012 Paralympics. Shelly damaged her spinal cord after falling from a tree aged 11 and was left paralysed from the waist down. Having been an incredibly active child, her parents encouraged her to find a new activity to keep her occupied. Shelly tried out a range of paralympic sports such as wheelchair basketball, swimming and table tennis before settling on athletics. Eventually she was spotted by an athletics scout at 15 and was invited to train at a national level. Shelly has enjoyed success as a wheelchair athlete from the very beginning. She won the Great North Run in 2005, setting a new British record for the half-marathon in the process. She is also the national record holder over 5,000 metres and won silver medals in her very first London Marathon in 2005 and again in 2006, but in 2007 Shelly won in a record time of 1:50:41. Naturally Shelly was called to represent Team GB at the 2008 Paralympics in Beijing, and she enjoyed a very successful tournament. She won a bronze medal in the 5,000 metres wheelchair final. Having originally been awarded silver for coming second on 8 September, a controversial protest arising from a multiple collision (six athletes crashed) in the final straight led to the race being re-staged four days later. Shelly later won a silver medal in the 1500m, and finsihed in a strong position, beating Switzerland’s Edith Hunkeler at the line. This summer will give Shelly the opportunity to improve on her fantastic achievements in Beijing. I’m sure we will be seeing her on the podium once again. Sarah Joanne Storey, née Bailey has an impressive array of medals to her name in an impressive array of sports. Sarah (then known as Sarah Bailey) began her paralympic career as a swimmer, winning two golds, three silvers and a bronze in Barcelona in 1992 at 14. 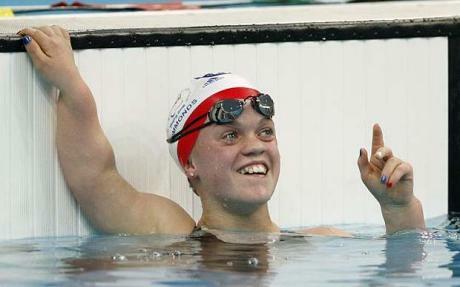 She continued swimming in the next three Paralympic Games before switching to cycling in 2005. At the 2008 Paralympic Games, her fifth, Storey won the individual pursuit – in a time that would have been in the top eight at the Olympic final – and the road time trial. She also competes against able-bodied athletes and won the 3 km national track pursuit championship in 2008, eight days after taking the Paralympic title, and defended her title in 2009. She qualified to join the England team for the 2010 Commonwealth Games in Delhi, where she was “the first disabled cyclist to compete for England at the Commonwealth Games”, against fully able-bodied cyclists. She was also the second paralympic athlete overall competing for England at the Games, following archer Danielle Brown earlier in Delhi. Due to her impressive achievements in disabled sport, Sarah was appointed Member of the Order of the British Empire in the 1998 New Year Honours. And following her success at the Beijing games was promoted to Officer of the Order of the British Empire. It seems wrong to call Eleanor Simmonds a hopeful given everything she has achieved already; having already won two gold medals in swimming at the Beijing Paralympics when only 13 years old. Eleanor began swimming at age four and entered her first competition just four years later. 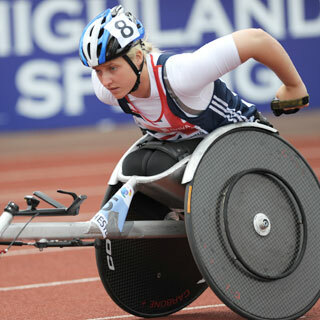 After watching the 2004 Paralympic Games on television, Eleanor was inspired to take her sport to an elite level and stepped up her training with the aim of qualifying for Beijing 2008. She achieved this and, competing in S6 disability category, Eleanor swam in the 50 m, 100 m and 400 m freestyle, 50 m butterfly, and 200 m individual medley. Despite Beijing being her first games and, at 13, being the youngest athlete in the competition, she went on to win gold in both the 100 m freestyle and 400 m freestyle. This incredible achievement gained wide recognition and in 2008 Eleanor was awarded the BBC Young Sports Personality of the Year. Not only that, but a year later she made a Member of the Order of the British Empire (MBE). At 14 she was the youngest person to have ever received this honour. Eleanor might be one of Britain’s best hopes winning, not just one, but a number of gold medals at this summer’s games. She says that she hates to lose, but looking at her career, you don’t imagine it’s much of a problem for her. 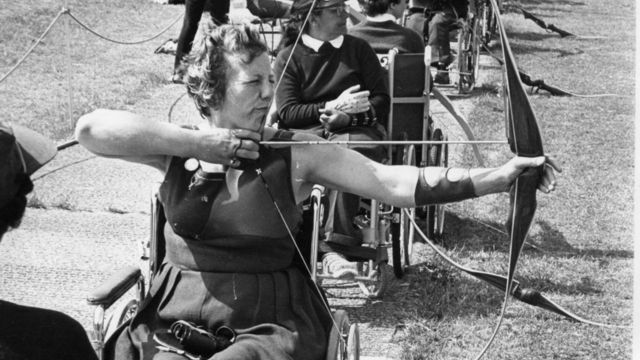 Margaret Maughan has the impressive distinction of winning Britain’s first Paralympic Gold medal at the inaugural Paralympic Games in Rome 1960 in Archery. 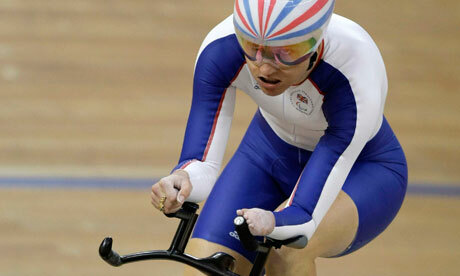 She went on to compete in four further Paralympic Games, winning a number of further medals. It was in Malawi that Margaret first encountered archery, watching ‘an eccentric Englishman’ firing arrows from a bow on a lush, green golf course in 1959. She had no idea at this point that she would be creating British history doing something very similar 12 months later. Margaret had been working as a teacher in Nyasaland, now Malawi, the landlocked country in south-east Africa, when she was involved in a very serious car crash. The Foreign Office transported her back to the UK for further treatment, where she was admitted into the Stoke Mandeville hospital, the spiritual home of the Paralympic movement, specialising in spinal injuries for injured soldiers from the Second World War. Margaret won a further two Paralympic gold medals, along with two silvers, at the Tel Aviv (68), Heidelberg(72), Toronto (76) and Arnhem (80) Games in dartchery (a combination of darts and archery) as well as lawn bowls. Margaret will be attending this summer’s games and will be an inspirational figure for all the young athletes competing for Team GB.